I got assigned a rare Postcrosser who likes handmade postcards, conveniently at a time when I could actually make a postcard - so I broke out some rubber stamps and stickers for US-1248400 to Australia. I got a kick out of making this one. 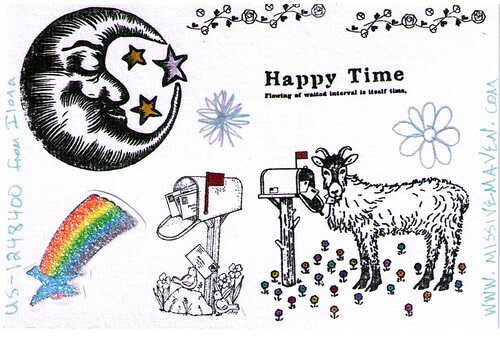 The mangled English stamp reads "Happy Time: flowing of waited interval is itself time." Deep. Daiso rubber stamp mangled English strikes again! I love it! Especially the goat. Yes - I neglected to mention the wonderful mangled English stamps were from Carroll! Awesome postcard! I hope the recipient enjoys it! Oh, I like this! LOL. Eaten mail comes back as prettiess. Nice. Fun card, and favorited 7 times! Good job.